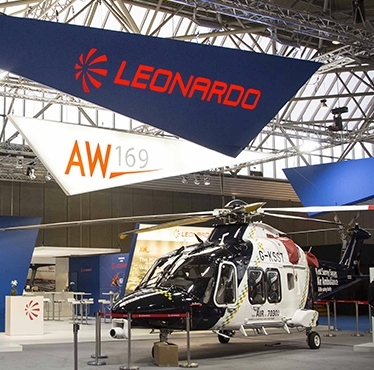 Posted on 14, October 2016 by EuropaWire PR Editors | This entry was posted in Aviation & Aerospace, Italy, Management, Netherlands, Transportation & Logistics and tagged AW169, AW189, Europe, helicopter exhibition, Helitech International 2016, Leonardo-Finmeccanica. Bookmark the permalink. AMSTERDAM, 14-Oct-2016 — /EuropaWire/ — Leonardo-Finmeccanica is attending Helitech International 2016(October 11-13, Stand No. 10B50), the most important helicopter exhibition in Europe, showing a range of solutions in the commercial and public utility rotorcraft sector demonstrating integrated capabilities, from platform and customized configuration through to support and training services. The company is displaying an AgustaWestland AW169 light intermediate helicopter in emergency medical service configuration,an AW189 virtual reality SAR simulator, a Virtual Interactive Procedural Trainer (VIPT) simulator, and dedicated tools to illustrate the Heliwise Health & Usage Monitoring System (HUMS) analysis service and the Skyflight mission planning system. Leonardo is starting illustrating its attendance at its booth on October 11th at 11.00. The AW169 4.6 tonne light helicopter, certified in summer 2015, is the only new generation aircraft in the light intermediate category in nearly 30 years. Agreements for over 150 units including firm orders, option and framework contracts have been signed to date. The aircraft is being delivered and is in service with a range of EMS and VIP customers in various nations globally and is set to enter service for other applications demonstrating outstanding mission versatility. The AW169 incorporates several new technology features in the rotor system, engines, avionics, transmission and electric power generation and distribution systems. For EMS roles it has already been chosen by operators in various nations such as, for example, UK, Italy, Norway and Switzerland. At Helitech Leonardo offers customers and visitors a unique chance to experience rescue by the AgustaWestland AW189 SAR aircraft in a virtual environment. The system combines virtual reality headset (with sound/visual) effects and real kits (platform staging, hoist) equipment. People will be immersed in how the AW189 operates and how it feels to be rescued in stormy weather conditions. This innovative technology, which gives a lively, compelling and entertaining demonstration, has never been used in this way before within our industry. Designed to meet the growing market demand for modern long range, extended endurance and large payload, the AW189 8.3/8.6 tonne is the most successful super medium category helicopter with more than 150 agreements signed by customers worldwide including firm orders, options and framework contracts. Almost 30 units have been delivered to operators worldwide to date for search and rescue, offshore transport, executive/corporate and utility duties and have amassed nearly 16,000 flight hours. Together with the AgustaWestland AW139 intermediate twin, which is still unmatched in this class in the global market with more than 960 helicopters sold, over 850 in service logging in excess of 1.5 million flight hours, the AW169 and the AW189 are part of the family of new generation helicopters of Leonardo. All types possess the same high performance flight characteristics and safety features as well as sharing a common cockpit layout, design philosophy and maintenance/training concept. This commonality is allowing more effective operations for customers operating helicopter fleets across the 4 to 9 tonne categories. The Virtual Interactive Procedural Trainer (VIPT) is a computer based simulator with a high fidelity graphical reproduction of the helicopter cockpit to deliver cost-effective procedural and familiarisation training. This system enables pilots to learn by practicing introduction to service, conversion and recurrent training tasks. Heliwise services support Health & Usage Monitoring System (HUMS) incorporating the latest technology in data analysis and use diagnostic models like Advanced Anomaly Detection and Advanced Vibration Data Mining. Both small and large fleet operators can expect significant savings by using the Heliwise Service. Aircraft operating costs are reduced through detecting issues before they could have a significant financial impact. The proven Skyflight multi-helicopter flight and mission planning system has been designed to help helicopter crews plan, execute and analyse their operational missions in a wide range of operational scenarios. Leonardo has developed a dedicated ‘App’ by which customers are able to download the Skyflight app from the Apple Store and install onto their iPad enabling access to the Skyflight web service. Leonardo ensures continued enhancements for Skyflight and customers will be introduced to the latest achievements at Helitech. Visit our focus on Helitech International 2016.